Safety at sea! These drum labels won’t peel off, or fade. How can you ensure the durability of labels for the marine transport of hazardous materials? Transporting hazardous goods by sea exposes barrels and drums to extreme elements. The contents must be kept secure and the warning labels intact for the entire journey and beyond. The labeling industry can now utilize a special UL Marking & Labeling Certification for Marine Use, which shippers can rely on to dependably identify chemical containers or drums. Certified labels are important: everyone needs to know what’s inside those containers, even those lost at sea. Performance and validation testing, certification and Follow-up services for the label value chain, from material suppliers, label printers and converters, to original equipment manufacturers. Two internationally accepted safety requirements address the shipment of hazardous materials on a vessel by water – the Globally Harmonized System of Classification and Labelling of Chemicals (GHS), and the International Maritime Dangerous Goods Code (IMDG). Packaging that contains dangerous substances is required to be identifiable, even after a three-month immersion in seawater. 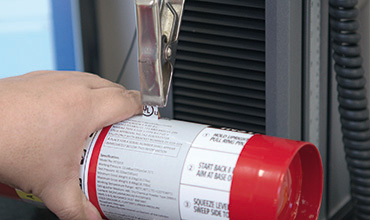 Under the UL Recognition Program, the UL Performance Materials division uses BS 5609:1986 – the labeling industry’s de facto standard – to test and certify for printed, pressure-sensitive, adhesive-coated labels for marine use. This helps ensure that such items as chemical containers and drums remain durably identified, for the safety of everyone who comes into contact with them. 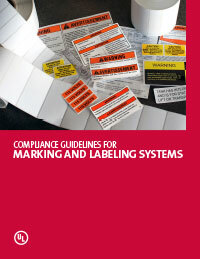 Automotive label testing – UL tests and verifies compliance to leading automotive label requirements including the majority of the test clauses with respect to adhesive attached labels on rigid surfaces in GM Standard GMW14573, Ford Standard WSS-M99P41, Custom OEM Requirements, and VW Standard TL 52038. 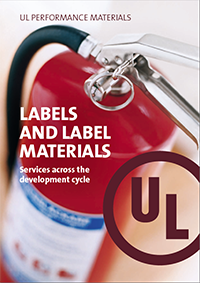 Marking & Labeling Systems – This UL program covers labels and label materials that have been submitted to UL for evaluation in accordance with prescribed performance requirements, so they can be used to display information on products. Authorized Label Supplier Program – Participation in this program enables label printers to provide authorized UL Certification Marks to their customers.